1. Alexander W. McClure sold his blacksmith business to S. W. Cushman for $1,200 in 1873. 1. L. Cushman blacksmith opposite the Union House Hotel in 1875. 1. Jabez Holben new blacksmith shop 70’ x 30’ built in 1905 just west of old shop which was here for 25 years. The old building was the 1st built after the fire and stood where Sargent’s furniture stand was in 1904 and was used as a general supply and hardware store by Bradley and High and moved by Holben in 1879. 2. 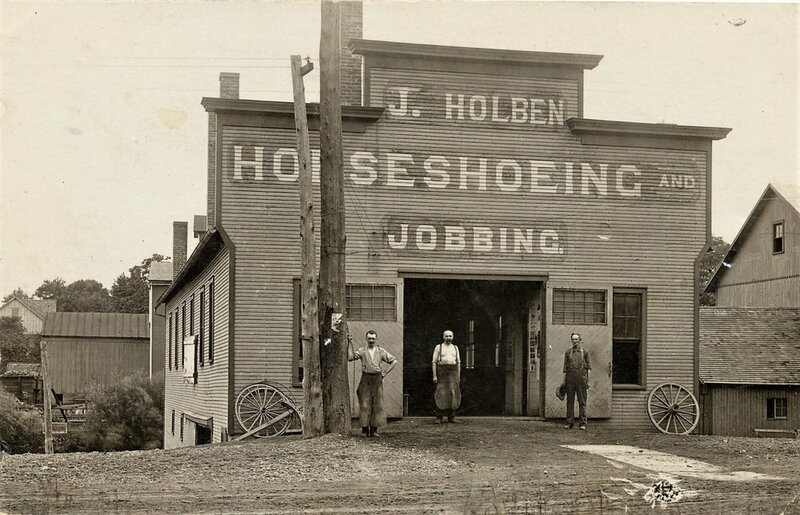 The Holben horse shoeing business was called a prestige blacksmith shop by American Blacksmith magazine in 1911. 3. Holben shop had power and air blowers; screens on windows and electricity. 1. Jabez Holben sold his blacksmith shop here since 1879 to Edward Newmeyer and Edward Rolph in 1915. 1. In 1923, J. P. Indoe, C. F. Davis bought ½ interest the historic Holben blacksmith shop. 2. F. Foskett to C. F. Davis blacksmith shop for woodworking, rubber tires on buggies, files saws, builds truck bodies in 1922. 3. Charles Davis’s blacksmith shop building was sold to Gibbs Motor Company for a body shop and the lot adjacent on the east of the blacksmith shop building for $12,000 in 1938. The added frontage extending more than 100’ on East Smith Road in 1938. 4. Charles Davis opened a blacksmith shop in the warehouse at the Hamilton property just east of the Medina Farm Bureau in 1938. 1. Graff Glass moved their business to 326 East Smith Road in 1969. 1. A. D. Faust carried mail and people to and from depots in 1875. 2. A. D. Faust and W. F. Leiter came to Medina in 1871 and started a livery stable opposite from where Jabe Holben's horseshoeing shop now stands. 1. There were gardens behind the Union House Hotel stables.in 1877. 1. Located one lot east of A. D. Faust Star Livery at the Union House Hotel. 1. Beedle brothers bought the blacksmith shop from A. E. Benford in 1897. 2. Elisha Beedle fought with Custer in 1876 at Fort Wallace and was struck in the left leg with an arrow. He lost site of an eye but, he took a scalp that he still has it 1930. The full story can be read below. 3. Jay C. Beedle Sr. died in 1899 and Elisha Beedle sold his blacksmith shop ½ interest to Edward C. Rolph in 1900. In the early '60s, when disunion of the government was threatened, the prompt response to the call for volunteers was nowhere more marked than in the Western Reserve, of which Medina is one of-the foremost counties. Her boys responded with the same spirit that characterized all of this section and her quota was quickly filled with as stalwart and fine young manhood as ever lived. Many never returned, many came back partially dismembered or broken in health, while many others were spared to mingle again with their loved ones and friends and witness the glorious rehabilitation and growth of the greatest country on earth—the land of the free and the home of the brave. But of the grizzled veterans who are still with us, the record of one —and only one, so far as we know, stands out uniquely from the others,; from the fact that with the closing of the Civil War, instead of returning home, as he was privileged to do and perhaps as he ought to have done, he re-enlisted in the war then raging against the Indians in some of the new states and territories of the western country, where he served for a period of three years under some of, the country's bravest heroes, most conspicuous of whom was General George Custer, who on June 25, 1876, together with his five troops of valiant horsemen, met death in ambush at the hands of "Rain-in-the-Face" and his band of savage Sioux. The one to whom we refer is Mr. Elisha W. Beedle of Medina, and there is probably no other man who enjoys a more general acquaintance in Medina County, due partly to the fact that he has always resided here, and partly from the nature of his life-long occupation, blacksmithing. For a half century Mr. Beedle shod Medina County horses, farmers from all parts of the county coming to Medina to have their work done. And while Mr. Beedle has not been attentive to this class of work for the past few years because of his advanced age, he will assure you, if you ask him, that if occasion demands he can do as good job as he could fifty-years ago. Mr. Beedle was born in Abbeyville, north on the old State road, in 1845, thus it being seen that he has already lived more than the allotted three score years and ten. At the outbreak of the war Mr. Beedle was too young to enlist and did not enter the service until 1864. Earlier than this, however, an attempt to organize a company was made by Fred Streeter, (later publicly executed in Medina for the murder of the Coy family), and Mr. Beedle, with a number of others, signed his name to the enlistment roll. But the company was never fully organized. In 1864, he enlisted in the 2d Ohio Cavalry. Co. B, at Columbus. He was with his regiment in several skirmishes near Memphis and in Arkansas and served until the close of the war, which found him at Little Rock, Ark. He immediately enlisted in the 3rd U. S. Cavalry, Co. B, which was about to depart for the seat of the Indian uprisings, under command of Marshall S. Howe. This regiment had previously been in the campaign against the Indians, but had been withdrawn during the period of the war. Now that this is service was at an end, they were now on their way back to the old warfare in the west. Leaving Little Rock, the regiment headed for Ft. Smith, thence to the Choctaw reservation to quell a disturbulence. Thence to the plains of New Mexico and Arizona. There were several fights with the Comanche and Apaches at Ft. Union, Ft. Craig, and Albuquerque, Ft. Selden and Pueblo, and it was during some of these days that Mr. Beedle first saw the famous chief, "Rain-in-the-Face", whom he afterwards saw many times, both on the field and at times when peace terms were trying to be negotiated. Asked as to what he considers the worst Indian encounter in which he participated. Mr. "Beedle named the one his regiment was in at Ft. Wallace. Col. Bankhead was the commanding officer said Mr. Beedle, "and we pulled in to the fort one evening for the purpose of further organizing it. Early in the morning a band of Comanche’s numbering about 1200 attacked us. We were not expecting any trouble. The Indians surprised us through disguise, in which they are experts. When first observed they were a considerable distance away. Some carried leaved branches, while others threw their blanket over their heads. In this way, at a great distance, the former resembled trees, and the latter looked like a herd of buffaloes. Some of our men reconnoitered with the result that they soon discovered their mistake. With whoops and flourishes! The redskins drove down upon us, the battle lasting for several hours. We lost about seventeen men and the Indians three or four times that number. It was during this fight, continued Mr. Beedle, "that I received a wound the scar of which I shall carry to my grave. An Indian arrow struck me a glancing blow in the forehead, tearing open a wide gash and injuring a nerve that cost me the sight of one eye. The arrow, like all Indian fighting arrows, was poisoned, and while he was not laid up from the effects of the wound, it was a long time in healing, and in fact I have suffered periodical eruptions from it ever since. Another exciting episode related by Mr. Beedle occurred at Ft. Craig, New Mexico. The Indians had been causing trouble in that section for some time by stealing many cattle herds. At this particular time they had driven off a lot of cattle being herded by some Mexican boys, capturing the latter as well. Mr. Beedle was commanded to form a detachment and go after the Indians. At this time he was an orderly sergeant. The Indians were found routed and driven away and the boys and cattle secured. Several of the redskins were killed in this skirmish and one of the soldiers took the scalp, ears and all, of one of them as a trophy. This is in possession of Mr. Beedle, and a constant reminder of the days when, as he puts it, "I had more fun than all the rest of my life." the millions. ''Oftentimes," says Mr. Beedle, "as we were traveling over the plains, we would observe immense herds at a distance. Suddenly the animals would turn and start for us with heads up and tails rising. We would have barely time to line up our wagons with wide gaps between, and throw ourselves underneath them. The buffaloes would come tearing down through the gaps and pass on, not, however, until a half dozen or more were bagged by our soldiers with their guns as they peered out between the wheels. When the herd had disappeared the soldiers would come out and quickly cut away the best eating parts from the dead animals, string them up along the sides of the wagons and travel on. Exposed to the sun day after day this meat would cure as nicely as if it were cured "according to Hoyle," declares Beetle. The immense number of buffaloes that roamed the plains forty or fifty years ago may readily be imagined when, according to Mr. Beedle, one of the finest specimens of a hide, highly decorated by the Indians, could often be secured from the latter in exchange for a plug of tobacco. The same hide today would bring $75 to $100. During his adventures with the Indians under Custer, Mr. Beedle became well acquainted with the late Buffalo Bill, who at that time was the general's chief scout. The last time Beedle met Cody was during the latter's trip to Cleveland with his Wild West show, when the famous Indian fighter learning of the Indian scalp and ears Mr. Beedle secured at Ft. Craig, vainly tried to persuade the latter to part with it. Mr. Beedle is justly proud of his record of promotion during his three years in the west, from private to corporal, then to duty sergeant, and finally to orderly sergeant, which position he held up to the time of his honorable discharge at Ft. Craig. Upon reaching Memphis one of his companions had not yet arrived and the Steamer Sultana was about to leave. The men waited for their companion and took the next steamer, the Miami instead. The Sultana, laden with 2400 human souls homeward bound from the war had proceeded but eight miles when one of the boilers exploded while most of the men were sleeping, and 170 were found death either from the effects of the explosion, or were drowned in the river. The steamer took on its crew at Vicksburg and was headed to Cairo, Illinois. Mr. Beedle witnessed hundreds of dead bodies floating down the river from the wreckage while awaiting the next steamer. 1. E. B. Lyons bought Beedle blacksmith shop opposite Arick’s livery from Edward Rolph in 1901. 1. Alfred Woodbury, at 1st home east of J. Holben blacksmith shop, sharpens saws. 1. David Brown, a Jew born in Arabia came to Medina in 1937. 2. 5 rooms and bath, furnace, with garage for rent in 1942 owned by David Brown. 1. Brown opened an auto wrecking, trucking and furniture salvage yard in 1941 just east of Gibbs Motor Company. 2. David Brown auto wrecking sold to Belle Krause and Joe Pieskowitz of Cleveland, Ohio. Business now called Square Deal and moved to the old Burgin place in 1941. 2. Abram Kimmel (wainwright) ran the wagon shop near Schafer’s tannery on Champion Creek 1859. 3. Hiram Bronson sold to Alex Kimmel for $300 in 1875. 4. Alexander Kimmel sold lot 26 on the Montville side to Milton E. Kimmel for $2,800 in 1902. 5. Alexander Kimmel wheelwright shop improved in 1858. 6. Alexander Kimmel sold house with 10 rooms, a well and cistern, good fruit in 1897. 1. In 1867, William Asire (undertaker 1850-1896) added an ambulatory entrance to his residence. 1. William Frazier was a Town Marshal. 1. Susan and Alfred Crees owned a truck garden and strawberry fields, both died 1931. 1. Alfred Crees property sold to Herman Munson and sons John and Tom in 1937. Vera Fields Renter, #126, (1945-1946). 2. In 1953, Helen and Evart Easterday sold their property to Ceylon and Helen Loehr. 1. In 1975, Ceylon Loehr sold his property to Ray and Donetta Klobnik. 1. Elizabeth and George Santee (painter) are building 2 new houses at 202 and 208 East Smith Road in 1903 and in 1916. 1. William Strong and sister, Helen Aylard bought it in 1918 from George Santee. 1. Theodore Weidner bough the 3 houses at the south-east corner of East Smith and South Broadway Street from the Bronson estate in 1940. Two double houses and a single each rents for $95 per month. 2. For sale, a well-built house for $4500. Seven large rooms with a bath, toilet and lavatory; oak floors down, oak finish, large closets, cement drive and concrete block garage in 1940. 3. Weidner sold the house to Ralph Nichols in 1941. 1. Willard Stephenson is now living at the Richard Wildman house in 1937. 1. The house at 202-210 East Smith Road was raised in 1982. 1. C.R. Failor got a telephone installed in 1916. 1. Belle and her daughter moved in the house in 1924. 1. Evelyn Graham married Richard Wildman in 1928 and took up residence with Belle Graham. Belle Graham died in the house in 1929. 1. Wildman’s rented to Ernest Rollins and moved out in 1942. 1. Ernest Rollins purchased the house and property from Richard Wildman’ in 1943. Marie and Earl I. Voorhees Residence, (1945-1959). 1. 6 rooms all modern hardwood floors with a cement drive for sale at $8000 in 1945. 2. Marie and Earl Voorhees purchased the house and property from Ernest Rollins in 1945. 3. Earl was a farmer and also worked at Oatman Market and at R. O. Bowman as a miller. 4. Marie died in 1959. 1. Luna Cox aka Whitney Luna Cox purchased the property from the executor of the estate of Marie Voorhees in 1959. 1. Owen Cox acquired the property from the estate of Luna aka Whitney Cox in 1971. 1. Ralph and Linda Ann Piatt sold the property to Bank-One, Inc. in 1981. 2. The house at 208 East Smith Road was raised in 1982. 1. Andy Ryan sold the property to Henry H. Northrop a builder in 1916. 1. In 1928 the house became a double rental. 2. Karlon G. Roop sold the property to Bank-One, Inc in 1981. 1. The house at 214 East Smith Road was raised to make way for the Family Video Store in 2008. 1. O. C. Shepard came to Medina from New York State. In 1850 he with many others sought their fortunes in the California “gold rush”, but returned to Medina to pursue business opportunities here. 2. In 1870, Mr. O. C. Shepard purchased lots from C. E. Bostwick for $300 and small building and will build grist and sawmill costing $10,000 to engage in the milling business. 3. In 1881 he installed the elevator and better machinery in the 4 story high mill that produced the “magnificent” flour and also the production of high grade feed products. O. C. Shepard died in 1893. 1. 43 rats killed in the Sheppard’s mill with sulphuic acid and arsenic of potassium in 1906. 2. The mill was managed by brother, Dwight C. Sheppard beginning in 1907. 3. The concrete elevator at Shepard’s mill stood 24’ tall in 1914. 5. The Shepard brothers rebuilt the feed mill that year, but did not add the flour mill. 7. The old chimney at the O. C. Shepard mill was taken down, the oldest and largest in the village surpassed only by the A. I. Root Co. in 1926. 2. Medina Farm Bureau moved to State Road in 1948. 1. Brothers Elbridge R. and John F. Moxley founded Medina Supply Company in 1941 and operated their concrete business at the old Clement building on South Broadway Street. 2. Medina Supply Company owned by the Moxley brothers moved to the Paul Anderson barn in 1943. Medina Supply Company is a dealer for Quonset Huts in 1946. 1. During the war the Navy needed an all-purpose, lightweight building that could be shipped anywhere, assembled quickly and easily, and come in a variety of sizes. 2. The name comes from the site of manufacture, Quonset Point Naval Base, Rhode Island where 150,000 Quonset huts were manufactured by the Navy. 3. After the war, the surplus huts were sold to the public and were adapted as quick and easy housing for the soldiers’ ‘baby boom’ families. 4. The acute housing shortage after the war brought them into the general housing market. The lightweight, prefabricated structures are created with steel ribs onto which the corrugated steel sheets are welded, creating the familiar tunnel shape. The absence of interior columns or divisions makes creates a flexible space applicable to any floor plan. 5. The Quonset hut has a long history, such as the longhouse built by some Native Americans. Disadvantages such as loss of usable space where the roof meet the floor, and lack of windows except on the end walls were met with creative design and engineering. 6. The buildings were sold locally by the Medina Supply Company. They would assemble the shell on site, after which the homeowner would complete the interior. The mass production created a very economical and quickly built home. A team could build one in a few days. 7. Medina’s first Quonset home was built in 1946 for Gaylord Patterson for his family of five who lived at 231 North Jefferson Street. 8. It is 20’ wide and 48’ long has a 20’ x 14’ living room, 9’ x 10’ kitchen, two bedrooms, a nursery, bath, 6 closets, radiant heat built into the concrete floors, and the sides and curved roof are insulated. 9. The shell cost was $1800. The Patterson’s spent an additional $4500 more to complete the interior, according to Mrs. Patterson, and “yes, there is plenty of room”. 10. Mrs. Alma C Doty lived here for 20 years. Her poem Service Flag in My Heart was set to music and played at the Tomb of Unknown Soldier during WWII. 11. They built ones for storage at the fairgrounds, a warehouse for Standard Welding Service, and 4000 feet of office space for Ohio Farmers’ Insurance. Amstutz Hatchery built a tunnel shell of wood and concrete block for hatching baby chicks. They are still being sold today and popular for storage, workshops, sheds, etc. 1. Medina Supply Company sold one-half acre of land at 248 East Smith Road to Ruth H. and Virgil W, Neuenschwander, (operator of Amstutz Hatcheries) in 1941. 1. The old Sheppard mill property was sold to Medina Supply in 1956 and the buildings were razed in 1957. 2. 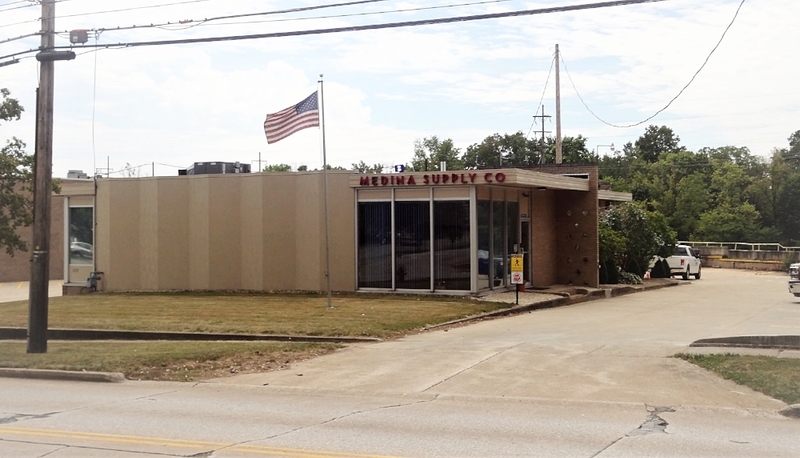 Medina Supply Company built a new International style office building in 1959. 1. Medina Cartage Company was formed as a division of Medina Supply Company for the operation and maintenance of their fleet of cement truck and other company vehicles. 2. A large concrete and brick building was built at 250 East Smith Road in 1959 to house the Medina Cartage Company. 1. Medina Supply Company was acquired in 1975 by Schwab Industries of Dover, Ohio, a leading supplier of building materials and ready mix concrete for residential, commercial and industrial markets since 1950. 2. On February 28, 2010 Medina Supply Company filed a voluntary petition for reorganization under Chapter 11 in the US Bankruptcy Court for the Northern District of Ohio. This is in joint administration with Schwab Industries Inc.
1. Medina Supply Company joined The Shelly Company in 2010. 2. Medina Supply continues to be a leading supplier of building materials and ready mix concrete for residential, commercial and industrial markets as well as Ohio Department of Transportation major projects by operating 110 mixer trucks throughout Northeast Ohio. 3. In 2013, Medina Supply, a division of The Shelly Company, and the Suicide Prevention Education Alliance (SPEA) are debuting a themed mixer truck that aims to raise awareness about suicide prevention. 4. The Shelly Company has been using its ready mix trucks as moving billboards since 2009. The company’s themed truck program reflects its employees’ passions and experiences. William C. Greisinger sold west Part-lot 51 to Dennis H. and Harriet M. Shaw in 1892. 1. In 1894, the Shaw’s built a house on their lot 51. 1. Frank E. Shaw has a machine shop for bicycle repairs and enamels them for $2.00 each. 2. In 1900, Frank Shaw is a blacksmith, wagon machine, bicycle and general repairs dealer in gasoline and steam engines. 3. Frank E. Shaw closed his blacksmith and machine shop business and moved to Cleveland, Ohio in 1929 and he retired as a stationary engineer in 1933. 4. Judge Fremont O Phillips (probate judge 1891-1897) bought 2 lots next to Frank Shaw and will build 2 houses to rent in 1903. 1. Harriet Melissa Shaw died in 1928, wife of Dennis H. Shaw who operated the Union Hotel on South Court Street and died in 1899. 3. Ben Tebbit re-sold the Shaw property to the Medina School Board of Education which hopes to get property behind it also in 1928. 1. James H. Hart sold part-lot 51 at the northwest corner of Smith and Jefferson Streets for $48 to William Schafer in 1902. 3. Arthur O. Schafer built a house east of the High School for William Schafer in 1909. 2. In 1915 a modern 10-room house, barn 24’x34’, concrete drive, with a lot 100’x225’, with up to 6 acres available. 1. William was a famous hunter; in his youth he once outran a horse from Medina to Sharon because the horse dropped dead ½ ways there; he also caught a fox with his bare hands. 2. William D. Frazier died in 1926. 1. In 1954, Mrs. Dickerhoof sold her property to the Medina City School Board of Education. 2. The Schafer house was raised by the Board of Education to allow more space for recess activities. 1. John H. Hart purchased Part-lot 51 from Mary Ringler in 1900. 2. John H. Hart died in 1915 and John G. Hart inherited his father’s property. 1. The estate of Lewis Westland sold the property to Leslie and Georgia Fortner in 1974. 1. Medina Law Real Estate Partnership property was sold to Wendy Cameron in 1996. 1. Edith A. Hale died in 1942. 1. Ben Waters sold his wagon draying business to Warren J. Anderson and Son in 1913. .
1. Warren Anderson sells horses at Paul Anderson’s barn in 1925. 2. Tony McHatton is an auctioneer of stock at Andersons Sale Barn in 1931. 3. Vera M. and Paul J. Anderson barn some distance to rear of the Medina Supply Company lot was bought by the Moxley’s in 1942. Paul Anderson had held consignment sales there. 1. James Scott moved into the Paul Anderson home in 1925. 1. Brothers Elbridge R. and John F. Moxley founded Medina Supply Company in 1941 and operated their concrete business at the old Clement Supply Company building on South Broadway Street. 2. Moxley’s moved their concrete supply business to the Paul Anderson barn from South Broadway Street in 1943. 1. In 1946, Medina Supply Company was a dealer for Quonset Huts, a WWII type of building. 1. Betty Clark who works at Andersons Drug and widow of Private William Clark lived with mother Ina Carey in 1942. 1. Elizabeth is a physical therapist and William C Anderson is a civil engineer. 1. Vera Anderson died in 1974 and Paul died in 1975. 1. Mrs. Alice Hindle makes body supports to Doctors specifications for clients in 1951. 1. In 1984, Santee and Associates sold the property to Lee J. Hutton. 1. In 1916, F. E. Leinseder build a house on the part-lot 61 purchased from Levi Witzman. 1. Clyde Dougherty to sell his 9 room house with, breakfast room, screened back porch, 4 car garage and chicken house in 1927. 1. In 1937, Clyde M. Daughtery sold his property to Vernon and Sadie Horton. 1. In 1939, Vernon Horton sold his property to Ruth and Howard Bauer. 1. In 1989, the Bauer house and business was transferred to their son, Bruce Bauer. 1. In 2000, Bruce Bauer sold his business to Mike Geschke. 1. In 2008, Michael Jodway Heating and Cooling Company purchased the property and established his business at 306 East Smith Road. 1. Horace and Gladys Williams bought the Levi Witzeman home 1940. 2. Nice house with 7 rooms a garage and hen house with lots of flowers in 1940. 1. Lloyd Bagley died in 1981. 1. Mary L. Fenn sold her property to John F. Crofoot in 1910. 1. 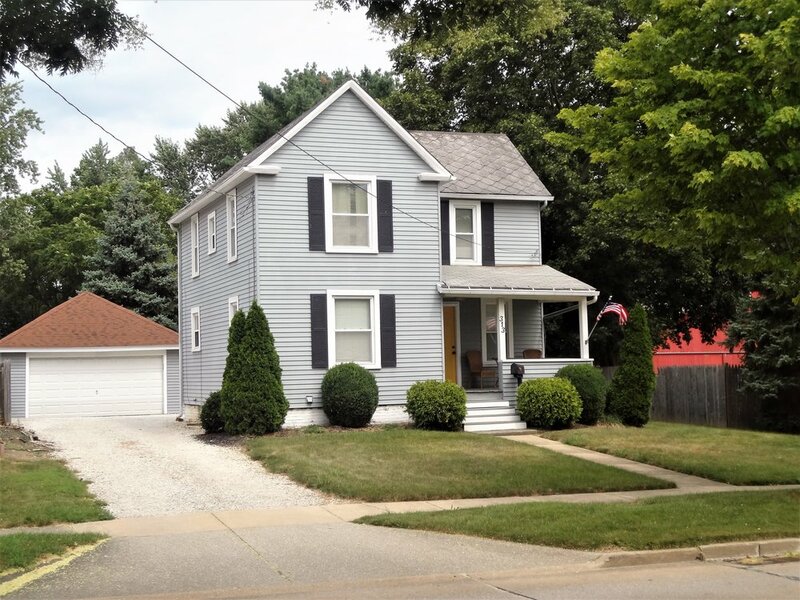 Cottage style house with 3 rooms and a bath; lot 75’ x 297’ with a barn in 1945. 1. In 1929, Williams is sued by neighbors and Fred W. Bohley in 1929. 1. Junk yard sold to Dr. W.A. Nichols but there was a several year lease in 1944. 2. NE corner East Smith and East Street, M. Pestkovitsky closed auto junk yard, eyesore, property owned by Dr. W.A. Nichols in 1949. 1. Ward Washburn opened a grocery in the Paul Anderson Building near the Bennett Bending Works in 1928. 2. Mr. Washburn was formerly the Medina County Auditor. 1. Paul and Vera Anderson sold their building to the Fredericks in 1937 and Louie and Grace started a small deli/grocery to serve the local area. 2. It seems they also acted as a lunch room for the Bennett Lumber Company formerly the Bennett/ Bending Works that was located next door. 1. The Strock family rented the 2nd floor for 3 years while Donald worked in the village as a taxi driver. 1. After the Fredrick's retirement, the store was taken over by Marcel Hoff and his wife Ruth. They successfully ran Hoff’s Grocery until 1968, when they also retired. Marcel also worked at Medina Water Treatment Plant for 30 years. 2. Paul Anderson sold goods in a storage house at rear of Hoff’s grocery in 1948. 3. Grace Frederick sold the property to Marcel R. Hoff in 1965 that had been leased since 1946. 1. Lucille and Clare E. Burkett (foreman at Henry Furnace Co.) rented the 2nd floor apartment from 1948 to 1952. 1. Floyd C. and Eveline Graff purchased the property from Marcel and Ruth Marie Hoff in 1968. 2. Graff's Glass moved their existing glass business from 108 East Smith Road, 2 blocks to the west, into the new location and added a service bay at the rear of the building. 1. In 2003 the building was purchased by Thomas Doyle to house his Burglar and Fire alarm business, FBN Systems. 2. After a slow process of fixing and remodeling, it was decided to use the first floor of the building, to display Tom's ever expanding private collection of antique fire equipment. 3. With the historic research that was done about the building, it was decided to capitalize on the humorous first business's name (Little Whiz Grocery Store) and it’s somewhat comical association with fire equipment. 1. The Little Wiz Fire Museum is dedicated to the education of individuals, and the furtherance and preservation of the early history of firefighting, and the generous individuals that bonded together for the protection of all. 3. Visitors are given a personal tour, with informative descriptions of the equipment displayed, so they will walk away with as much education and history as possible. 4. The Museum is open 9am to 4pm most Saturdays through the year, or other times by appointment. For private tours or students and small groups, you are advised to call.. 330-419-0200... to make arrangements. 1. John and Lena moved from #345 East Smith Road and built a new house in 1913. 1. Robert H. Ulmer died in 1965. 1. Medina Bending Works was founded in 1891 by Scott Bennett, born in Windfall in 1857 and taught school in Weymouth as young man. 2. The Bending Works was originally located on South Elmwood Street across from East Mill Street and was so named because of the process used in making wagon wheel rims. 3. Later the manufacture of spokes was added and neck yokes, Whipple trees, double trees, bent rims and other wagon material is produced for the trade. 1. In 1894, Mr. T. G. Andrews sold his interests in the business to George Bauer. 2. The Bending Works was moved in 1895 to newly purchased land at 342 East Smith Road. 3. Bennett Bending Works built a new office building north of the mill 20”x26” built of hollow blocks and finished with stucco and fireproof in 1912. 4. In 1897, Scott Bennett purchased the business interests of George Bauer. 1. Medina Bending Works is well quipped for the caring and seasoning of lumber with three large dry kills utilized for that propose. 2. Gertrude V. and Frank Lacroix sold part lot 61 to Bennett Bending Works in 1931. 1. In 1926, the company name was changed when the lumber business became a more prominent part of the total operation. 2. Scott Bennett’s Sons, Carter I. and Homer Bennett joined the firm in 1926. 3. Scott Bennett turned the business reins over to his two sons Carter and Homer and took a well-deserved retirement in 1934. 1. The company sold prefab brooder houses 10”x12” in 1945. 2. Homer and Carter Bennett sold an interest in the business to L. Roy Lehman and Ty Brooke in 1960. 3. L. Roy Lehman acquired the interest in the lumber business from partner Ty Brooke in 1964. 1. Bennett Lumber Company was sold to L. Roy Lehman and new partner, H. M. Jaeger in 1965. 2. The business name was changed to Bennett Lumber and Home Center in 1965 and they converted 500 feet of display space into more than 25,000 feet in a short few years. 3. As early as 1967 when Roy Lehman Jr. joined the firm the business has been a family run operation with both sons and daughters and spouses of Lehman and Jaeger involved together with other 45 employees. 1. Ownership of the business was transferred to their sons, Roy F. Lehman and David Jaeger in 1981. 2. During their ownership they have added space in the plumbing department, kitchen and bath remodeling and appliance area to a total of 28,000 feet. 3. The Bennett Lumber Company and Home Center is one of the oldest in the county with 110 years of continuous service supplying the needs of the community. 1. Roy F. Lehman and David Jaeger rented the building and property to James Lumber Company under a four year lease in 2001. 1. For nearly five years the buildings were unoccupied while the owners Lehman and Jaeger searched for a tenant. 1. Roy F.. Lehman and David Jaeger sold the buildings and part-lot 61 to Habitat for Humanity in 2011. 2. In 2012, Lehman and Jaeger sold two parcels on the east side of Lot 61 to the City of Medina. 1. At Christmas in 1850’s father kisses us under the mistletoe, a bunch of evergreens tied together and nailed to the center of the wood ceiling; candle in shiny brass candlestick in window sill with a piece of evergreen and holly wrapped around it inviting everyone for a cup of tea and a bit of bun or cake. Medina's oldest house, according to the Medina County Historical Society, is the Sillet House at 345 East Smith Road. 'The house was probably built in 1840 and not later than 1845" said Ross Trump, antique dealer and owner of the house "I'll bet the house did not cost $200 to build. 'The architect who designed it evidently got hold of a good book on architecture and then they did their best with what money they had. "The house is constructed of wood cut right from the lot it is built on "It has very low ceilings and probably the lowest doors in town. The low ceilings were to conserve heat. As our country became more prosperous people built their homes with higher ceilings. The house is now just as it was originally." Trump said "It has never been remodeled or Improved just restored, and addled a bathroom and the heating system " There are five rooms downstairs and two up "The house stood here alone for many years. Then in time the neighborhood became built up. Those houses deteriorated and were torn down. Now the neigh hood is built up again." He said, through it all, the little house remained cool and aloof, disregarding current changes in style like a wealthy, opinionated old lady not concerned with status. The house will never go out of style because it was never in style. Old records and maps show its owner, Sillet was a sexton of the cemetery of the Episcopal Church. George R. SiIlet, a native of England was a wood sawyer and janitor of the Congregational Church in addition to being a grave digger. An article written by Dr. H. Durham of Shenandoah, Iowa who formerly lived in Medina and wrote about Medina Village and its people in 1843, says "Mr. Sillet could saw five cord of wood a day. He had long arms and his word was as good as his noteGeorge R. Sillet’s daughter Mrs. Sarah Whitney lived there for many years. "After her husband died, Mrs. Whitney and her son. George worked at the A. I. Root store*. They lived in Akron for a while too." said Miss Florence Philiips, curator of the Munson House and Medina County Historical Society records. 1. John and Lena Gayer moved to #339 East Smith Road in 1913. 1. Sillet’s Daughter Sarah Whitney Root lived here for many years. 3. Trump removed stoves added furnace and bath. 1. Trump rented to James Robson in 1968.